Killer baby rabbit! 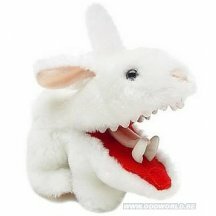 This 5-inch (12.5 cm) plush bunny may be cuddly and cute, but he's a killer. Just look at the chompers on this guy! 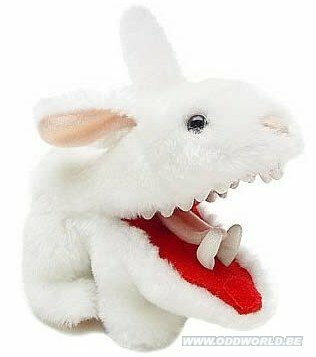 From that wild and wacky movie Monty Python and the Holy Grail, comes this hilarious plush baby rabbit with sharp pointy teeth. Well, they're not really that sharp. But you can still use him to terrorize your kids, pets, and spouse!